Most often, we associate gazebos with corporate events or summer weddings. What many people don’t realize is, that a portable gazebo can also add a little glamour and shade to your very own back garden. Typically, portable gazebos come in a variety of materials and styles, making them an asset for many different purposes. Whether you need a way to easily shade your outdoor seating on a hot summer’s day, to make sure your kids won’t burn while playing in their kiddie pool, to add a touch of vintage to your summer dinner party, or to create a cozy, romantic lounging space in that beautiful spot at the back of your property, portable gazebos can be the perfect solution for you. With the five most popular types of portable gazebos mentioned below, we want to give you a good foundation of ideas on how you’ll easily expand your living space to the lush outdoors next summer. This rectangular gazebo is the most basic and most commonly encountered option. Most of us have seen this type of gazebo at a variety of garden parties and barbecues. While the classic rectangle is not particularly beautiful, it definitely is the most versatile type of gazebos. Since it is rather easy to assemble and fairly lightweight, you can move this gazebo around easily, allowing you to use it for a variety of purposes. 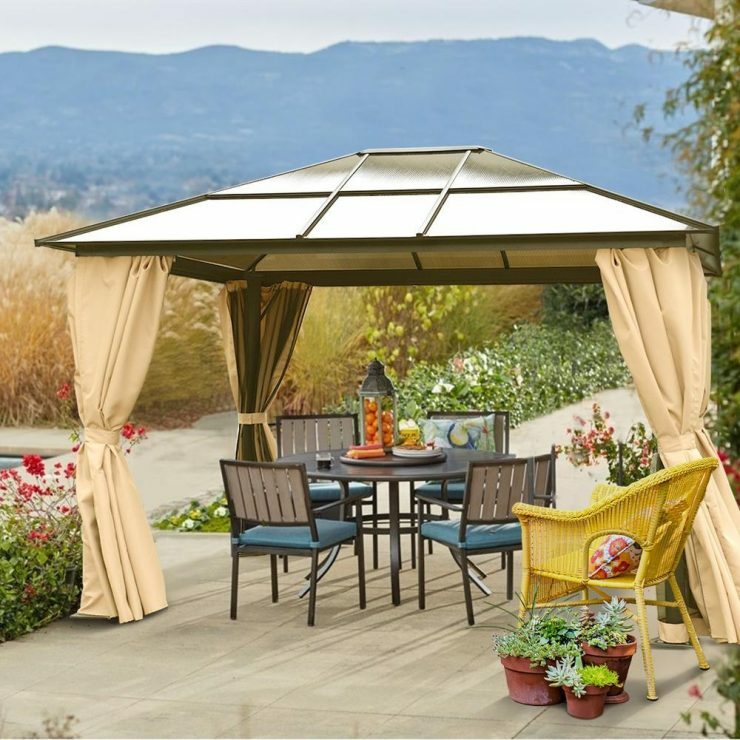 Whenever you find yourself in the situation of needing a bit of shade, whether for a party, over your kid’s pool, or even to provide shelter for particularly sensitive flowers or plants, this most basic option is a great, reasonably priced pick. Additionally, for many of these products, a closed canvas cover is separately available as well, making it an even more versatile gazebo. The next step up from the basic gazebo is a steel framed model. This type of gazebo is usually more sturdy thanks to its more elaborate structural supports. As in our example, many steel frame gazebos feature beautifully wrought support poles that can be used to double up as places to hang small flower pots, and oftentimes these supports come with inbuilt shelves or baskets to hold decorations, flatware, books, or gadgets. 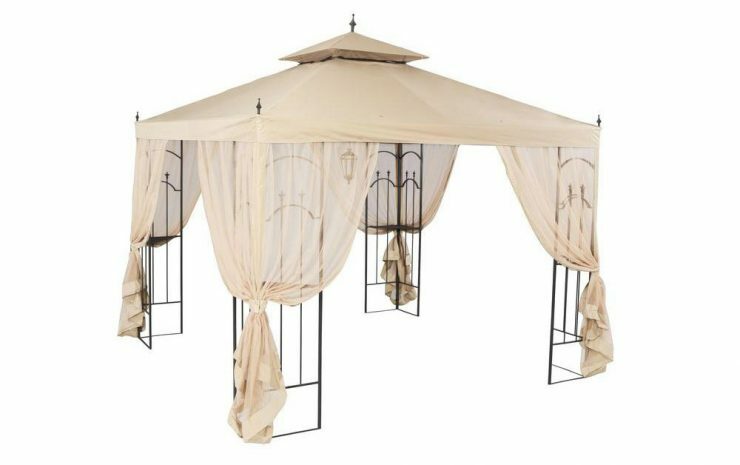 The steel frame gazebos oftentimes come with higher quality covers, including mosquito netting that looks beautiful when tied back during the days. Generally speaking, steel framed gazebos can add a romantic touch to your garden, and are particularly well-suited as cover for your outdoor dinner seating. If you’re looking for something more sturdy than a plain canvas gazebo that allows you to use your outdoor seating even during a refreshing summer rain, hard top gazebos are your best bet. 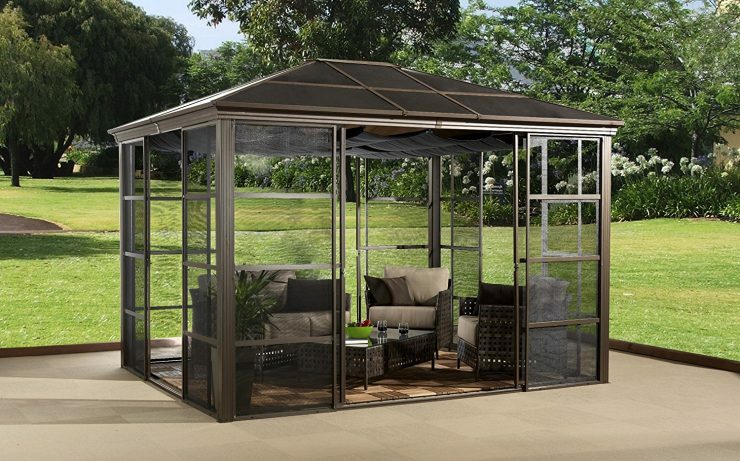 As the name suggests, these gazebos are equipped with a roof, typically made of either fiberglass in the see-through option, or aluminium in the closed version. Depending on how much you’re willing to spend, these days there are also gazebos with inbuilt solar paneling available. Enclosed gazebos are a great way to protect your outdoor seating from weather and can create an additional room to your house without losing the feeling of being outdoors. 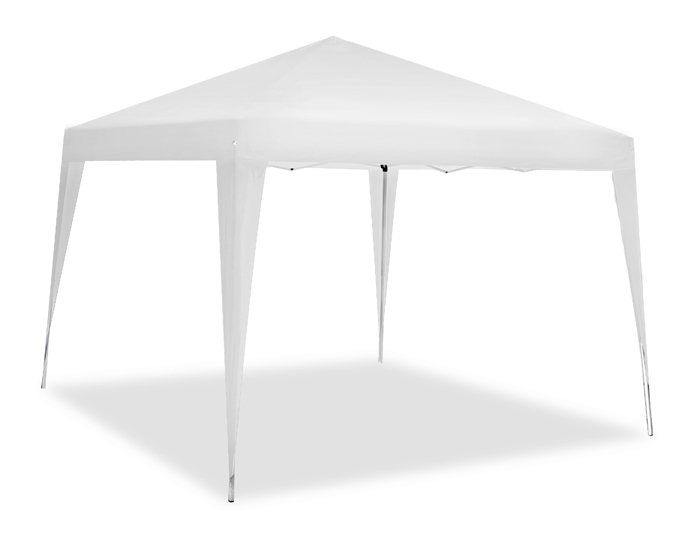 This kind of gazebos can either sport lightweight fiberglass panels, or simply mosquito netting in the screens. They usually come with one or more sliding doors, the latter allowing for a true gazebo feeling when all panels are opened. Depending on the type of enclosed gazebo you chose, these can also be able to withstand winters, including snow, thus making them a popular choice for hot tub covers. Additionally, some models, as our example, allow for adding a floor to the construction, making the gazebo a perfect spot for creating a cozy extended living room complete with a loveseat and comfortable chairs. 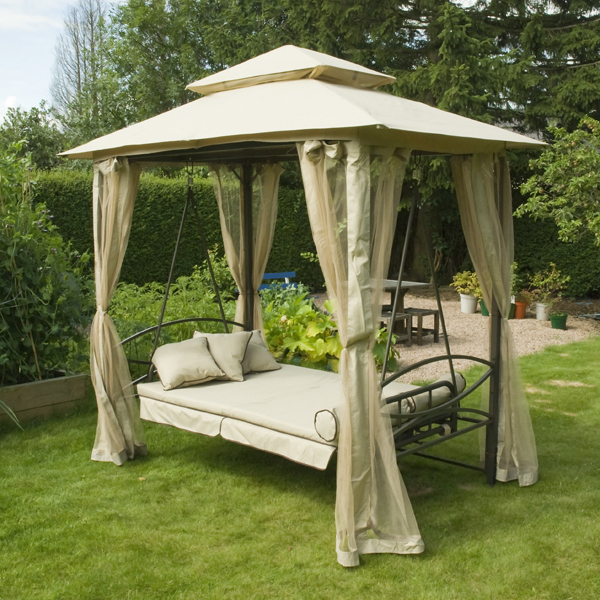 Another beautiful variant of gazebos is the swing gazebo. Typically, you have the choice between picking a swing seat, a kind of suspended sofa, or a swing bed. Both versions are equally appealing, and invite family and friends alike to just kick back and enjoy the shade and let the slow rocking lull them to complete relaxation. Swing seats are perfect for the busier parts of your garden, near a pool, near the barbecue, or next to your children’s favourite spots. They allow you to keep an eye on whatever is going on around you from the perfect comfort of a luxuriously padded sofa. Swing beds, on the other hand, are the perfect safe haven in the quieter parts of your property, giving you the perfect surrounding to just lay back and let nature lull you into an all-encompassing sense of peace.